Infused with shine-enhancing conditioners, the Shine Therapy’s ceramic plates style and condition your hair at the same time. Heats to a precise 300-430-degree Fahrenheit in 30 seconds. 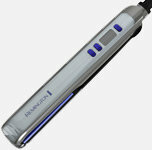 The floating plates allow hair to flow freely through the straightener for smoother, less damaged results. View larger. The Remington Therapy collection–a hair care system that delivers conditioning properties while styling–provides solutions to combat irritating hair problems and works to increase hair health and vibrancy. Because the conditioning benefits are already in the straightener, you’ll add shine and save time normally spent adding conditioning products before styling. If you want to achieve salon-quality hair straightening from your own home, meet the Shine Therapy Straightener. Ceramic has become the big buzz word in hair straightening–that’s because ceramic improves heat distribution and helps the selected temperature remain even throughout the entire plate, so there are no hot spots. Ceramic also creates an effortless glide with no snagging, flattening your hair cuticles for silky-smooth results. 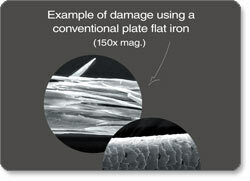 Plus, it ensures long-life plate wear, protecting the plates against styling products and scratching. The Shine Therapy Flat Iron helps you avoid dehydrated, lifeless hair, thanks to its ceramic plates infused with heat-activated, shine-enhancing conditioners containing avocado oil and vitamin E. The plates emit these conditioners evenly onto hair through microscopic pores. This design styles and conditions your hair at the same time, giving you straight, smooth, shiny hair. Conventional straighteners don’t ensure that all hair comes into contact with the heated plates on the first pass. More passes equals more damage. With the Shine Therapy Flat Iron, you’ll sidestep this problem, thanks to floating plates that allow hair to flow freely through the straightener and maximize the amount of hair touching the plates. The Shine Therapy Flat Iron heats up in 30 seconds and provides precise 300-430-degree Fahrenheit heat for fast and long-lasting results. 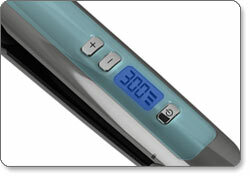 It also boasts a digital temperature display with temperature lock for precise, easy heat adjustments. 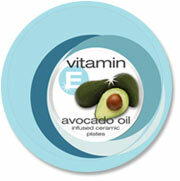 The vitamin and avocado-infused plates have been tested and are assured to last for up to four years. If you’ve ever left the house and worried that you forgot to switch off your straightener, you can breathe a sigh of relief. 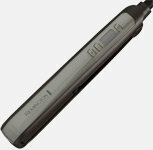 The Shine Therapy Flat Iron’s auto-shutoff function takes effect after 60 minutes. And when you’ve finished styling, it’s easy to store away with its handy hinge-lock. For maneuverability, it boasts a salon-length swivel cord. This straightener also features worldwide voltage, so there’s no need to skimp on your style routine, whether you’re at home or abroad. The Shine Therapy Flat Iron is backed by a four-year warranty. 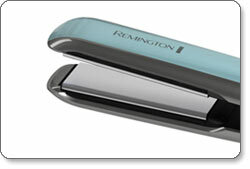 Remington Style Therapy: Shine Therapy 1-inch Flat Iron.